Hyperpia or farsighted is a condition in which the eyes can focus to see at a distance, however has more difficulty seeing up-close. Anatomically, the eye is described as being short, therefore the image falls behind the eye. The eyes focusing ability decreases with age. Thus, a patient with hyperopia will first need reading glasses and eventually bifocals or progressive glasses as the distance vision fails. If I See Alright, Why Do I Need Glasses? Even though hyperopia does not always cause blurred vision, it may cause eye strain or an eye turn. During reading or computer usage, the condition is even more significant. Hyperopia is correlated with ocular fatigue and learning disorders. Thus, glasses are often prescribed to take a load off the eyes. Patients with mild or moderate hyperopia will need glasses up close earlier than their emmetropic counterparts. They usually land up needing bifocals earlier. These are unhappy patients who prided themselves on having 20/20 vision until their late thirties or forties. All of a sudden, they can’t see at near and then they can’t see at distance. They loose at both distances. The optics of their glasses have more distortion than their myopic counterparts and they have more trouble with glasses and trouble seeing contact lenses to put them in their eyes. Fortunately, LASIK refractive surgery has come a long way in making them happy again. 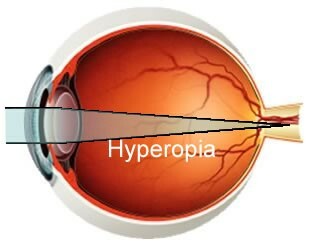 Patients with hyperopia can also wear glasses or contact lenses.